BELLIN -Plan du Port et ville de Louisbourg dans l'Isle Royale. N°XVI. BELLIN, J.N. / ARKSTEE & MERKUS. - Plan du Port et ville de Louisbourg dans l'Isle Royale. N°XVI. Plan du Port et ville de Louisbourg dans l'Isle Royale. N°XVI. - BELLIN, J.N. / ARKSTEE & MERKUS. 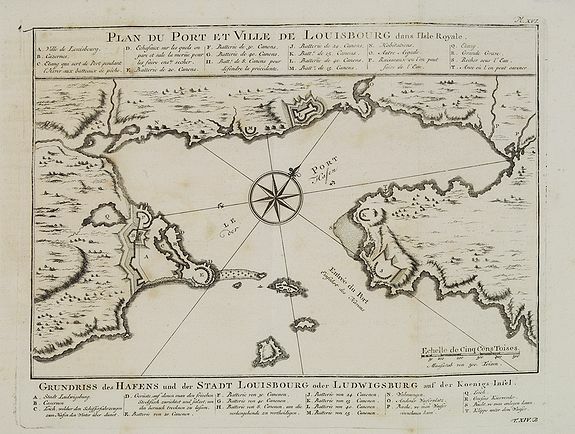 Title : Plan du Port et ville de Louisbourg dans l'Isle Royale. N°XVI.. Size : 8.4 x 10.9 inches. / 21.3 x 27.8 cm. Description :An important early map of the harbor of Louisbourg in the southeast portion of the island shown in great detail. Large compass rose and fleur-de-lis in the harbor. German title below: "Grundriss des Hafens und der Stadt Louisbourg oder Ludwigsburg auf der Koenigs-Insel." War broke out between France and England in 1744 and a large number of maps were produced to describe the areas involved. The French lost Louisbourg to a determined British army, but the treaty of Aix-la-Chappelle returned Louisbourg to the French. By 1758 Louisbourg was once again attacked by the British. All dated 1744, but published in 1756 in the German edition by Arkstee & Merkus. Condition : Some light discolouration of paper. In very good condition.